A Tohoku University inter-graduate school team has been engaged in the development and manufacturing of a 50 kg class small satellite, named SPRITE-SAT, under the university initiative. The team, comprised of Lecturer Yukihiro Takahashi of the Graduate School of Science, and Professor Kazuya Yoshida of the Graduate School of Engineering, offered to participate in the dual launch program of the Japan Aerospace Exploration Agency (JAXA), which aims to launch a small satellite as a piggyback of a larger one in a single launch. The application was approved with much anticipation, and has been added to the list of candidate payloads. The launch can be looked forward to as early as fiscal 2008. 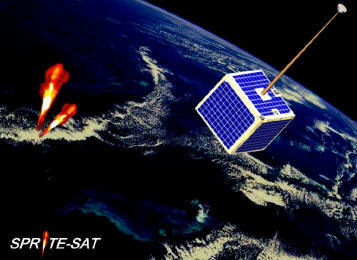 If the program is realized, the SPRITE-SAT will be the first satellite in the world capable of taking horizontal images of “sprite”, lightning-induced optical phenomena in the altitude range of 40 - 90 km, and investigating relationship between terrestrial gamma ray flashes and electrical discharge luminous emissions from thunder clouds.